What is so special about pig, anyway? Special? May my ears never indulge such blasphemy, and may the infidels who utter such a question be anathema. I pray that my first attempt to roast a pig on December 20 may bless your palate and not rain curses on my household and the children of my grandchildren (um, you should pray, too). I can think of nothing better to tease you with than to have you watch a short clip (about 9 mins.) of Anthony Bourdain’s show, “No Reservations,” where he visits Puerto Rico. As he explains in the beginning of the show, this is not your typical tourist travel show. Bourdain sets out to find the real culture of a city or country. He gets away from the tourist traps and the kitsch and explores the places we wish we could visit. He gives you an insider’s view of people’s homes, how they cook, how they interact with their families and friends. Bourdain sums up his visits not with quaint descriptions of monuments or places, but by identifying a culture or society by its people and their beliefs, and exploring those beliefs through their food. As I mentioned before, this upcoming pig roast I am hosting will be my first time (I’m the “39 Year Old Virgin”). I’ve given myself plenty of planning time (about 2 months) to ask a lot of questions and do some research. But when the owner of La Marginal, the Puerto Rican eatery here in town (the only one, as far as I’m concerned), heard of what I was attempting when I visited him for advice yesterday, his eyebrows raised a little bit. Part of me was a little concerned. “What the $!#@ was I thinking? I’ve already invited everyone!” The other part of me doesn’t care, as my wife will attest to. I always have big plans, but never really give the details too much thought. I’ll let someone else do that. I’m a big picture kind of guy. In this situation, however, the onus is completely on me. Although Leonel has roasted some large hogs, he prefers to to stick to the smaller ones (25-40 lbs.). Right here you are probably wondering: “What size porcine are we talking about cooking here?” Well, it needs to be about 100 lbs. based on the number of people coming. For him, as a restauranteur, the effort needed to cook a large hog is too great for the minimal return. For my purposes, however, I’ll just have to wake up early – real early. To make things easier for me, however, I will be asking everyone to bring something. As some of you may know, I’m real picky about people bringing food to my parties. I normally have a theme and I like for my sides to match the main course. No different here, people. Very shortly you will be hearing from me and how you can help. I’ve never hosted a party where there will be more than 75 people attending, so this will be interesting. So, back to my question: “What was I thinking?” Roasted pig, that’s what I was thinking. I thought I would continue to get you excited about the upcoming pig roast by providing you with a picture of a typical Lechon Asado plate. 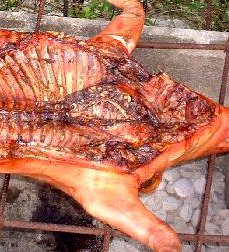 The lechón (or roast pig for you gringos) is a typical Puerto Rican dish, usually served at large gatherings. 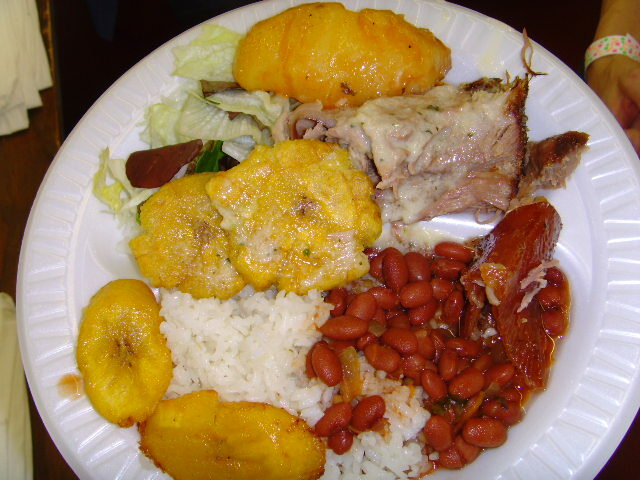 Common side dishes (for me, anyway) would include yellow rice and pigeon peas (arroz con gandules), tostones (or fried plantains), and amarillos (literally translated as “yellows,” these are baked sweet plantains). No green stuff here except for in the marinade. The lechón is the Puerto Rican version of pulled pork. The only difference, really, is in the marinade. Whereas your typical barbecue pulled pork would be marinated with a vinegar or apple cider base, the Puerto Rican version is marinated with a “mojo” (pronounced moho). My mojo will consist of bitter orange, olive oil, garlic (enough to choke a brood of vampires), fresh oregano, salt, and pepper. Pretty simple, yet incredibly flavorful. What is bitter orange, you might ask? Well, I can’t find it around here. Although it is pretty common in the tropics, even my specialty grocer doesn’t carry this particular orange. Here, it is commonly referred to as a Seville orange. However, you can make a semblance of the bitter orange by combining equal parts of regular orange juice and lime juice. It will work just fine for me. By the time this pig is done cooking, it will just completely fall apart. Get your appetites ready.